Go to original pattern for design DROPS 197-27. 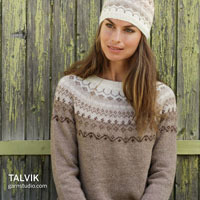 Knitted sweater in DROPS Merino Extra Fine. The piece is worked back and forth with texture and displacement. Sizes S - XXXL. 20 stitches in width and 30 rows in height with texture (A.2) = 4'' x 4'' (10 x 10 cm). DROPS CIRCULAR NEEDLE SIZE 4.5 MM / US 7: length 60 or 80 cm / 24" or 32"
Decrease after the 1 edge stitch in garter stitch when the 2nd stitch on the row is worked in garter stitch as follows: Knit 2 together. 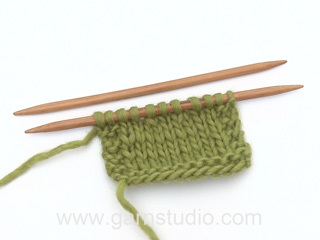 Decrease after the 1 edge stitch in garter stitch when the 2nd stitch on the row is knitted as follows: Purl 2 together. Decrease before the 1 edge stitch in garter stitch when the next to last stitch on the row is in garter stitch as follows: Work until there are 3 stitches left on the row, slip 1 stitch as if to knit, knit 1 and pass the slipped stitch over the knitted stitch. Decrease before the 1 edge stitch in garter stitch when the next to last stitch on the row is knitted as follows: Work until there are 3 stitches left on the row, purl 2 together. The piece is worked back and forth with circular needle in sections and sewn together to finish. The piece is worked bottom up. Cast on 129-137-145-153-165-177 stitches with circular needle size 4.5 mm / US 7 and Merino Extra Fine. Purl 1 row from the wrong side. Now work pattern from the right side as follows: 1 edge stitch in GARTER STITCH - read description above, work A.1 over the first 8 stitches, A.2 over the next 50-54-58-62-68-74 stitches, A.3 over the next 2 stitches, A.4 over the next 7 stitches (= the middle 7 stitches on the row), A.5 over the next 2 stitches, A.6 over the next 50-54-58-62-68-74 stitches, A.7 over the next 8 stitches and 1 edge stitch in garter stitch. Continue back and forth like this. The number of stitches stays the same, but the pattern is displaced. REMEMBER THE GAUGE! 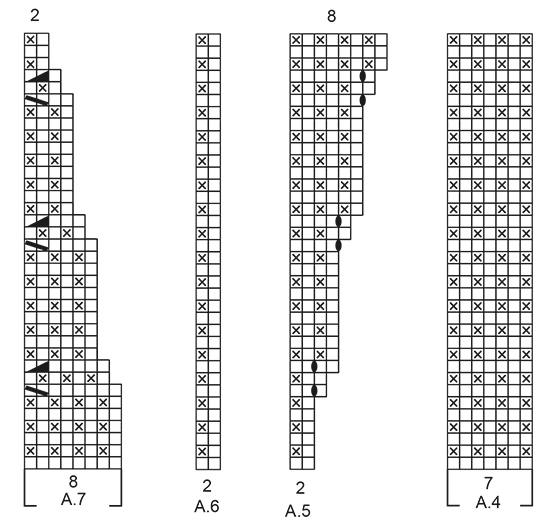 When the diagrams have been completed in height, continue the pattern in the same way, i.e. increase stitches in A.3 and A.5 and decrease stitches in A.1 and A.7. When the piece measures approx. 34-34-35-35-35-35 cm / 13 3/8"-13 3/8"-13 ¾"-13 ¾"-13 ¾"-13 ¾" from the cast-on edge and up the side of the piece – adjust so that you finish after 5 rows after an increase, work the next row from the right side as follows: Work pattern as before over the first 64-68-72-76-82-88 stitches on the row, work 2 stitches in the next stitch (= mid-stitch), work pattern as before over the last 64-68-72-76-82-88 stitches on the row = 130-138-146-154-166-178 stitches. Insert a marker thread in each side of the piece. THE PIECE IS NOW MEASURED FROM HERE! Place the first 65-69-73-77-83-89 stitches (seen from the right side) on a thread for left shoulder and work the right shoulder. ROW 1 (wrong side): Work until there are 2 stitches left on the row, tighten strand. 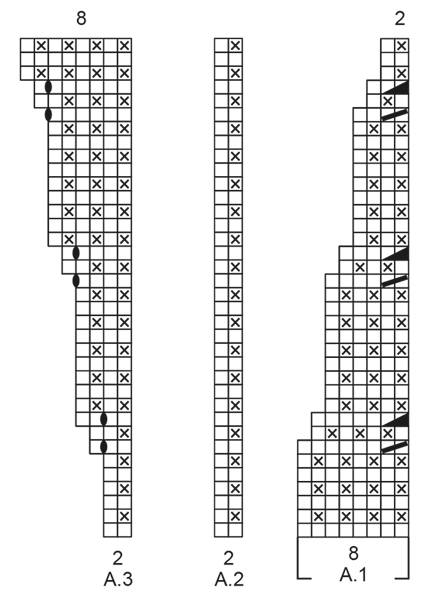 ROW 2 (right side): Work back. ROW 3: Work until there are 4 more stitches left on the row than the previous time (= 6 stitches), tighten strand. Repeat rows 3 and 4 and turn when there are 4-4-4-4-4-4 more stitches left than on the previous row 7-11-10-13-12-15 more times (= a total of 8-12-11-14-13-16 times) and then when there are 5-3-5-0-3-3 more stitches left than on the previous row 3-1-2-0-3-1 times (NOTE: In size XL turn after there are 4 more stitches left each time). Work 1 ridge over all stitches on row where you decrease 5 stitches evenly on row = 48-52-55-57-62-68 stitches left on shoulder. Bind off. The piece measures approx. 60-62-64-66-68-70 cm / 23 5/8''-24 3/8''-25¼''-26''-26¾''-27½'' / 23 5/8''-24 3/8''-25¼''-26''-26¾''-27½'' from the shoulder down. ROW 1 (right side): Work until there are 2 stitches left on the row, tighten strand. ROW 2 (wrong side): Work back. ROW 3: Work until there are 4 more stitches left than the previous time (= 6 stitches), tighten strand. Repeat rows 3 and 4 and turn when there are 4-4-4-4-4-4 more stitches left than the previous row 7-11-10-13-12-15 more times (= a total of 8-12-11-14-13-16 times) and then when there are 5-3-5-0-3-3 more stitches left than the previous time 3-1-2-0-3-1 times (NOTE: In size XL turn when there are 4 more stitches left each time). Work 1 ridge over all stitches on row where you decrease 5 stitches evenly on row = 48-52-55-57-62-68 stitches left on shoulder. Bind off. The piece measures approx. 60-62-64-66-68-70 cm / 23 5/8''-24 3/8''-25¼''-26''-26¾''-27½'' / 23 5/8''-24 3/8''-25¼''-26''-26¾''-27½'' from the shoulder down. Cast on 121-129-137-145-157-169 stitches with circular needle size 4.5 mm / US 7 and Merino Extra Fine. Purl 1 row from the wrong side. Now work pattern as follows from the right side: 1 edge stitch in garter stitch, work A.2 until there are 2 stitches left on the row, work the first stitch in A.2 and 1 edge stitch in garter stitch. Continue back and forth like this. When the piece measures 44-45-46-47-48-49 cm / 17 1/4''-17 3/4''-18''-18½''-19''-19 1/4'' – adjust to match the front piece where you bind off stitches for the armholes, and bind off 2-2-2-4-4-4 stitches at the beginning of the next 2 rows for the armholes in each side = 117-125-133-137-149-161 stitches. Continue working until the piece measures 56-58-60-62-64-66 cm / 22''-22¾''-23 5/8''-24 3/8''-25¼''-26''. Now work garter stitch over the middle 25-25-27-27-29-29 stitches on the row. When you have worked 2 ridges over these stitches, bind off the middle 21-21-23-23-25-25 stitches for neck and each shoulder is finished separately = 48-52-55-57-62-68 stitches on each shoulder. 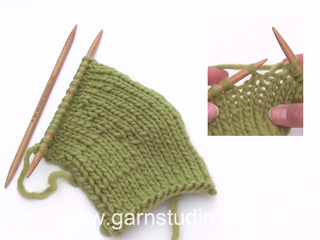 Continue with texture and 1 edge stitch in garter stitch in the side and 2 stitches in garter stitch towards the neck. When the piece measures 59-61-63-65-67-69 cm / 23¼''-24''-24¾''-25½''-26 3/8''-27 1/8'' / 23¼''-24''-24¾''-25½''-26 3/8''-27 1/8'' work 1 ridge over all stitches. Bind off. Work the other shoulder in the same way. The piece measures approx. 60-62-64-66-68-70 cm / 23 5/8''-24 3/8''-25¼''-26''-26¾''-27½'' / 23 5/8''-24 3/8''-25¼''-26''-26¾''-27½'' from the shoulder down. Cast on 45-45-49-49-53-53 stitches with circular needle size 4.5 mm / US 7 and Merino Extra Fine. Purl 1 row from the wrong side. Now work pattern as follows from the right side: 1 edge stitch in garter stitch, A.2 over the next 16-16-18-18-20-20 stitches, A.3 over the next 2 stitches, A.4 over the middle 7 stitches on the sleeve, A.5 over the next 2 stitches, A.6 over the next 16-16-18-18-20-20 stitches and 1 edge stitch in garter stitch. Continue back and forth like this. 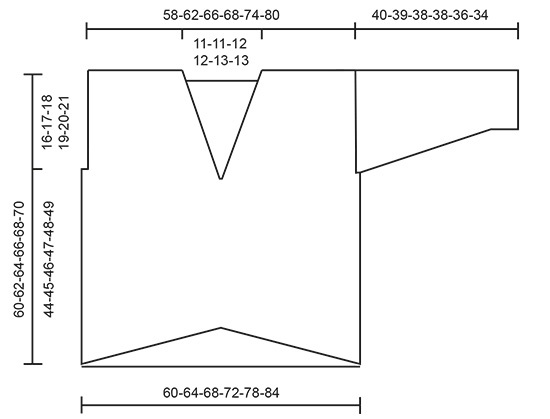 You increase stitches on the middle of sleeve in diagrams A.3 and A.5. When the sleeve measures 7 cm / 2¾'' decrease 1 stitch in each side - remember DECREASE TIP! NOTE: In size XXXL you do not decrease, but continue to work texture and increase stitches as before. Decrease like this every 10th-12th-18th-30th-28th-0 row a total of 10-8-6-4-4-0 times. When the diagrams have been completed in height continue to increase in the middle of the sleeve as before until you have increased a total of 20-20-18-18-18-16 times and there are 65-69-73-77-81-85 stitches on the needle. Then continue with texture until the sleeve measures 40-39-38-37-36-33 cm / 15 ¾"-15 ¼"-14 7/8"-14 ½"-14 1/8"-13". Bind off. Work the other sleeve in the same way. Sew the shoulder seams with grafting stitches. Sew sleeves to body inside the 1 edge stitch in garter stitch on the body and inside the bind-off edge on the sleeve. Sew sleeve and side seams in one go inside the 1 edge stitch in garter stitch. 3:22: Bonjour , j arrive au denier paragraphe pour l épaule droite .Après le rang 4 (rang raccourci ).Je ne comprend pas la suite,pouvez vous m expliquer ?Merci beaucoup .cordialement. Bonjour Mme Tribout, vous répétez les rangs 3 et 4 et tournez quand il reste 4 m en plus que la fois précédente, soit la fois suivante (rang 5 = 10 mailles, puis 14 mailles et ainsi de suite) cf taille pour le nombre de fois puis tournez quand il reste 5-3-5-0-3-3 m en plus que la fois précédente 3-1-2-0-3-1 fois au total. Bon tricot! Bonjour , j arrive au denier paragraphe pour l épaule droite .Après le rang 4 (rang raccourci ).Je ne comprend pas la suite,pouvez vous m expliquer ?Merci beaucoup .cordialement. Dear Mireia, on the 7th row you will incrase in A.3/A.5 (with a yarn over worked twisted on next row) and in A.1/A.7 you will decrease as shown in diagram. On next row work the sts as shown in diagram. Happy knitting! Bonjour! C'est 39 cm. Bon tricot! En ce qui concerne le dos, les explications ne sont pas très claires. Je suppose que les diminutions des épaules se font comme celles de devant, sinon pouvez vous m'expliquer? Merci de me répondre. Bonjour Mme Savornin, le dos ne se tricote pas comme le devant, on rabat les mailles des emmanchures et on continue simplement comme avant, on rabat les mailles de l'encolure puis on termine chaque épaule séparément. Bon tricot! Bonsoir, Tout d’abord merci pour ce modèle il est sublime ! Je le tricote en mélanger cotoneribo + brushed alpaga silk c’est très doux ! J’en suis aux manches et je ne comprends pas pourquoi il faut diminuer (d’ailleurs, de chaque côtés ?) alors que sur le modèle graphique les manches s’élargissent.. ? Merci ! Bonjour Elodie, dès le début de la manche, on augmente dans A.3 et A.5, mais, pour éviter que la manche ne s'élargisse trop vite, on diminue en même temps de chaque côté. On conserve ainsi le motif du dessus de la manche (A.3 et A.5) mais on diminue en même temps de chaque côté pour contrôler l'élargissement de la manche. Bon tricot! Bonjour Mme Schütz, les diminutions des épaules se font côté emmanchure, on ne diminue pas pour l'encolure. Bon tricot! Bonjour! J'arrive à l'emmanchure sur le devant et j'ai 2 questions: 1. Après avoir rabattu les mailles de l'emmanchure, est-ce qu'il faut toujours garder 2 mailles lisière? Ou continuer directement avec le point fantaisie. 2. Plus loin, il faut tricoter des "rangs raccourcis", que signifie "serrer le fil"? Merci d'avance! Bonjour Beatriz, côté emmanchure on tricote seulement 1 m lis au point mousse, (les 2 m lis sont côté encolure). Après avoir rabattu les mailles de l'emmanchure, on continue avec 1 m lis au point mousse. Cette vidéo montre la méthode de base pour tricoter les rangs raccourcis et donc, comment serrer le fil au début du rang suivant. Bon tricot! 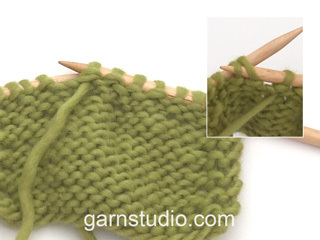 Hi Anna, If you use a different garn to the one suggested, it is important to do a trial piece with the new yarn to get the right knitting tension and then adjust the number of stitches in the pattern. Happy knitting! Für Karin und Stefanie über die Schulterschrägung. Die Linie wurde weg, um Misveständnis zu vermeiden. Ohne die verkürzten Reihen wurden die Schulter etwas schräg, wegen Strickrichtung/Verschiebung. Viel Spaß beim stricken!